Mutated trees in the exclusion zones in Fukushima & Chernobyl without leaders. Dead whale on U.S. west coast of Pacific Basin. Map showing coastline of Pacific Northwest filled with seaborne Fukushima nuclear fallout. Living kids with extra heads & deformed bodies in Chernobyl asylums. Additionally, in support of the above paragraph, we have included a highly censored Central Intelligence Agency report depicting the end of the world based on bibilical and historical societal records and depictions of global cataclysmic events ...which we examine in light of the polar reversals of the sun's magnetic fields, resulting solar flare natural attacks upon the Earths magnetic fields and pole reversals ...in an effort to explain current Fed interest rate banker-owed and directed military industrial space age weaponry including ionospheric spraying of heavy metals, ionospheric and stratospheric heating (high frequency active auroral research ...HAARP, programs ...high altitude and space based laser weaponry aka space based missile defense systems using lasers and HAARP technologies) ... which we believe based on constant worldwide chemtrail applications fulfill among others two functions including proving the CIA premise that the Earth can be destroyed by manmade space age weaponry that can duplicate biblical and scientific end of the world scenarios ...starting with biblical and societal and scientific historical events and accounts of life being exterminated on Earth or otherwise severely extinguished ...and, for the Fed/G8 to threaten countries by deploying water shortages, uncontrollable fires, earthquakes, tsunamis, and tornadoes all targeted to make nuclear reactor sites melt down and extinguish life, destroy power grids and infrastructures upon which society is today largely dependent, and sicken or end all life with DNA that replicates itself after its own kind ... because this annihilation appears to be the current state of world affairs as dictated and currently implemented by the prehistoric, Old and New World Orders and one-world governments of the last 5,000-to-7,000 years. VOA transcript, Sep 1, 2015 (emphasis added): Sharp Rise in Whale Deaths Being Investigated - Since May, 30 dead whales have washed ashore on the Gulf of Alaska. (Deborah Fauquier, NOAA): ‘And the average for the whole year generally is 8, so it’s definitely significantly elevated and for us that was a reason for concern.’ The Extreme Mortality Event, as scientists are calling it, has triggered an investigation. A Plus, Aug 27, 2015: The Story Behind This Picture Is So Mysterious, Scientists Are Scratching Their Heads; What is going on here? !… the number has skyrocketed. Thirty whales spanning at least four species have been found… NOAA Fisheries scientists and partners are very concerned about the large number of whales stranding in the western Gulf of Alaska in recent months, Dr. Teri Rowles of the NOAA said… these enormous, gorgeous animals are dying in such high numbers. VOA, Sep 1, 2015: While President Barack Obama is in Alaska, he might have this question: Why have 30 dead whales washed ashore… [NOAA's] Fauquier said the extreme mortality event was complicated… Fauquier noted that in the ocean, toxins move up the food chain. Some of the whales actually filter the phytoplankton and the zooplankton… they get the toxins through that method…. as you go higher up the food web, more toxin gets concentrated.… NOAA hopes to explain why the whales died and why they perished in such great numbers. Cordova Times, Aug 28, 2015: Whales..Thirty dead whales ….And no one knows why… when thirty of them die in four months, three times the usual rate, something is not right…. between 700 deaths over the years, scientists have managed to perform two full necropsies. For this particular event, they’ve done one limited necropsy… While they keep an eye on algae, they have been testing all possibilities. Possibilities like fallout from Fukushima, and while they did radiation testing as part of the limited autopsy, it came back with background levels that would occur normally in Alaska, said Julie Speegle, speaking on behalf of NOAA. Newsweek, Aug 27, 2015: Over the last few months, dead whales have been appearing regularly on beaches along the Northern California coast. In the same period, 30 whale carcasses have washed up along the coast of Alaska, puzzling scientists. Washington Post, Aug 30, 2015: Concerns mount as whales are found dead in Gulf of Alaska - Researchers are scrambling to determine what’s behind the death of 30 whales… Other dead whales have been reported off the coast of British Columbia…. starvation or disease could be behind the deaths… The more likely culprit is unusual water conditions. -8702.1- also see: Physics and Radiobiology of Nuclear Medicine (Springer), Jun 29, 2013: Leukemia is one of the most common cancers induced by radiation in humans, accounting for one in five mortalities from radio-carcinogenesis. Risk of leukemia varies with age, younger persons more prone to radio-carcinogenesis - Leukemia appears as early as 2-3 years after exposure, average latent period of 5 to 10 years. Ever wonder what happens to mammals (including people) & forests by nuclear power plants? ...and in the sea, whales, dolphins, seals, walruses & sea lions? ...from Fukushima plutonium, military sonar & depleted uranium, oil exploration soundings, & aerial aerosols, weather warfare & electro-magnetic pulse weapons? We are currently in the Sixth Great Extinction of Life on Planet Earth ...& it is manmade. Using this site, you can identify & document the magnitude, suffering & horror of this extinction & also pinpoint who is to blame, their weapons of choice & why they should be arrested, tried, convicted & marched to the gallows. (l) Military lasers mounted on jets taking out enemy vehicles with precision accuracy are similar to the burnt vehicles at 911/WTC dispersed around Manhattan & censored from the public mind —(here) (here) (here)— (c) HAARP-like microwave-like electromagnetic pulses used for ionospheric, stratospheric & ocean heating can push the weather offshore, in this case from L.A. ...remember when the weather front went around California & instead of raining in California, snowed in Texas & Mexico ...in 2017 or 2018? —(here) (here) (here)— (r) Note the Species Loss graph; we can attribute this man-made species loss to various kinds of pollution in the ocean and on land: plastics, pharmaceutical, hospital, chemical & pesticide wastes; nuclear waste; catastrophic nuclear events; normal day-to-day discharges from nuclear reactors of radionuclides into the atmosphere & sea; military industrial use of depleted uranium arms in the land & sea; petroleum industry use of sonar like sounding in undersea oil exploration, that bursts the eardrums & organs of sea mammals & other sealife; military use of sonar undersea; military industrial use of HAARP ionospheric & stratospheric heatings for weather warfare & drought or heat weaponry by weaponizing the Earth's weather systems & creating artificial solar flares to affect earthquake warfare & lasers to take out vehicles & to start forest fire, warfare. Exhaustive investigative reporting by Nuclear Weather Forecast has discovered that all of the major corporations that are causing damage to the Earth in these ways, are owned & directed by the eight dynastic banking families that own the Federal Reserve & those that serve them ...& another name for the Fed interest rate bankers, is, the military industrial complex —(here) (here) (here) (here)— Welcome to Nuclear Weather Forecast, your lifeline to saving the planet by bringing to trial & executing those money-issuing families in the interlocking directorate of the Federal Reserve Board to whom we pay the interest on the national debt each year, who use this obscene wealth to intentionally destroy & sicken all life on the planet & distort DNA so creatures can no longer reproduce themself after their own kind, & in-so-doing blaspheme Divine Order. Tritium accumulates in your body & destroys your eggs & fetus ...ever wish they told you the truth? Ever wish they told you the truth? Nuclear industry creates two-headed flowers, insects, cats, whales, dolphins ...and, children. As documented for over 70 years, since 1940, when U.S. Wall Street interests fed radionuclides to pregnant women and children and watched them sicken. And, when the 'jellyfish children' were born in the South Pacific nuclear testing zones, without bones. And, in the Nevada test area in the U.S., people got cancer and died -- they still do, today; in the tri-county area around Hanford, children are born without brains and buried in child cemetaries reserved for them; in Russia children in the nuclear testing zones ...unborn and born babies that are cyclops and distorted are preserved pickled in large jars. In Belarus, where the wind carried the fallout from Chernobyl, the kids were born with extra heads, flesh sacks outside their bodies holding their brains or kidneys, hands coming out of their necks, legs without lymph glands producing tree trunk legs covered with tumors. Nuclear is destroying life on Planet Earth. Phase out nuclear and phase in solar now ... when Fukushima blew, Japan shut down 54 reactors. We can shut down all reactors in the world, tonight ...and make you more safe. Stop all nuclear liars, lock them up and throw away the key. Are you a member of an environmental group? Do you nurture Life? The Pacific Ocean is dying: Federal Reserve directors whose corporations and military tactics kill the Ocean should be marched to the gallows. It is the 11th Commandment. All nuclear reactors are designed to discharge radionuclides into the air, water and sea. And it is impossible to safely contain nuclear waste. Radionuclides destroy DNA and all prevent mammals (including people) and all life forms with DNA to accurantly bring forth others of their own kind (see first page of Bible), but to bring forth mutations. Nuclear destroys Divine Order and those who advocate nuclear are enemies of Divine Order, Nature, God, Earth, the Environment and all Life. They are your enemy. Is the immediate threat of a lifeless planet on your radar? Are you now an endangered species? Should mass murderers die? These four life-&-death questions are among the most emotional and most difficult to answer in the world ... but you can ...confidently, authoritatively and without guilt, together we can be strong enough to do what needs to be done to help the Life Force survive ...after reading our site & our two free e-books. Step beyond hard love. It is our survival. Your adversary keeps you from realizing your angelic calling, prevents you from awareness of the wonder, awe, mystery, sanctity and preciousness of life and living – in this awe-inspiring unknown miracle known as life, creation and love ... walk softly upon Mother Earth, for She is alive.Your adversary has no love for you , takes your life against your will, bleeds you dry. Together, we can be strong ... and do what we needs to be done for us to stay living. ...or, starve to death because the chitin and plankton at the bottom of the food chain is dead from radionuclide poisoning (and these effects mentioned above), as are the feeder fish like herring, so sea life and food chains are starving to death ...as are millions of seals, sea lions, seabirds like gulls and pelicans from Alaska to Chile and the Artic to Antartic. Our two books and this website will give you clues to have your own 'aha moment' – figure out who's at fault and should be tried, judged, sentenced then marched to the gallows for nuclear ecocide, genocide and omnicide ...or, not? Deliver nuclear industry to termination, it's deserved demise. Viewing the pictures (above), you witness nuclear industry as it attacks God, Divine Order, Mother Earth, the Great Spirit and Holy Ghost. There are angelic consequences calling to punish the nuclear industry as Angelics fight the adversary to arrest and punish pro-nukers for committing murder, war, genocide and ecocide ...crimes against God, Divine Order, Mother Earth, the Great Spirit, Holy Ghost and Life Force. God decreed on page one of the Bible that all living things come forth after their own kind; nuclear destroys the ability of DNA to faithfully replicate itself after its own kind... nuclear industry is the enemy of Divine Order, nuclear industry is the adversary. The adversary – being the nuclear industry – sickens, mutates & aborts Divine Order and Life Force. Deliver nuclear industy to termination, it's deserved demise. There are eight thousand district attorneys in America. Do your job! It is time for our district attorneys to round these people up, bring them to justice and march them to the gallows. Do your job! Conceiving within 25 miles of a nuclear reactor facility can mutate your child-to-be ... you have seen such children in the previous videos and pictures that were exposed to radionuclides at the meltdown in Chernobyl. This is now happening in Japan because of Fukushima ... but doctors abort these children and tell the mother she miscarried, terming miscarriages, 'unfortunate pregnancies'. This is not to say your child conceived in your womb will be born mutated, or aborted because of deformities ... but statistics and studies within the last 30-to-75 years confirm that women and their unborn, and girls living by nuclear reactors get more cancer than men or boys, or those living farther away. Kids around Hanford nuclear reservation today are born without brains. In Missouri, by a nuclear dumpsite kids are born today with double sets of teeth and extra limbs. In Belarus, downwind of Chernobyl nuclear facility, with hands growing out of their shoulders. In Russia, by a nuclear test ground, there are large jars holding dead babies, a cyclops, a creature like the monster from the movie, Alien, with that large myshapen head. In India, where a school was built with cement made from radionuclides, most of the children are deformed ... the list goes on and on (read the e-books to protect yourself) ... help shut down all nuclear reactors, now. Help replace them with solar power, now. 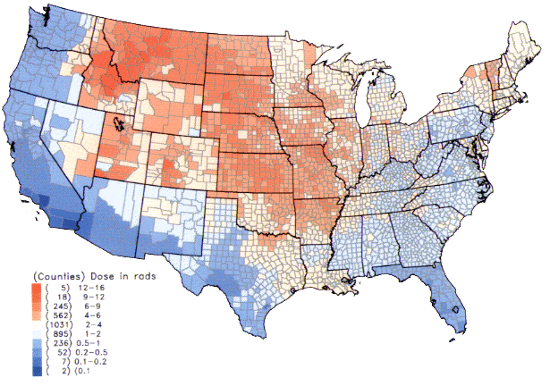 Downwinders - Per capita thyroid doses in the continental United States of Iodine-131 resulting from exposure routes from atmospheric nuclear tests conducted at the Nevada Test Site, (map, left). Adverse health effects: increased cancers, thyroid diseases, malignant and cancerous brain tumors, female reproductive cancers and congenital malformations are observed in downwind communities from nuclear fallout and contamination. National Cancer Institute map (left) refers to Nevada Test Site downwinders, only ...map is included for dispersion patterns, not dose estimates. Fukushima is hundreds of times worse than Chernobyl (use the MS Word 'find'/search engine in Nuclear Power is Not Safe & Clean). Children born mutated in Japan are referred to as, 'an unfortunate birth'...and murdered or aborted and the mothers told they miscarried. Nuclear has made cancer the new 'normal' -- nuclear industry has made cancer 1-in-4, 1-in-3, 1-in-2 and now, 1-in-1. See these normal flowers and birds (below)? Are they not beautiful? Yet birds that flew thru nuclear fallout die or fall from the sky, survivors' babies are born blind and cannot fly. Rain falling through fallout in the sky, down onto the flowers, vegetables, grains and water changes them into unnatural, unintended forms not meant by Mother Nature or Mother Earth the Great Spirit or Holy Ghost or Dove of Peace or our Creator. So, it is rightly said, the nuclear industry and those who proffer it blaspheme our Creator and all that is Holy, you, your unborn child, and all that lives. -> the infant mortality rate doubled in Seattle and British Columbia from fallout, and an organic farm in Southeast Portland shut down because its soil was too full of Fukushima fallout to grow vegetables and fruit for market? -> there are 20,000 otherwise accounted for deaths in the U.S. since March 2011, when the first fallout from the three meltdowns from Fukushima Japan assaulted the United States? ...and, that it will keep killing more people? 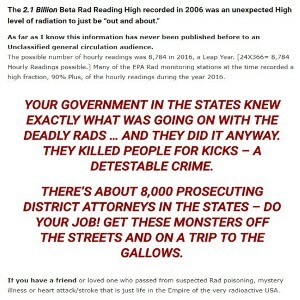 -> the Pacific Cascades from British Columbia to California is permanently contaminated with Fukushima nuclear fallout? ...and, with residual atmospheric nuclear fallout, too? ...and, fallout keeps killing practically, forever? Why Are Women Not Told? Why are women not told? – The infant mortality rate doubled in Seattle and British Columbia from fallout, and an organic farm in Southeast Portland shut down because its soil was too full of Fukushima fallout to grow vegetables and fruit for market? There are 20,000 otherwise accounted for deaths in the U.S. since March 2011, when the first fallout from the three meltdowns from Fukushima Japan assaulted the United States? ...and, that it will keep killing more people? 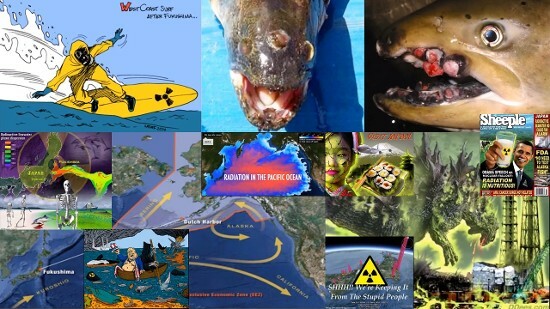 The Pacific Cascades from British Columbia to California is permanently contaminated with Fukushima nuclear fallout? ...and, with residual atmospheric nuclear fallout, too? ...and, fallout keeps killing practically, forever? The death toll from high yield atmospheric nuclear testing is revised from 1 million dead, to include accumulative low yield fallout that adds up ... to 60 million dead and 100 million cancers, plus several million abortions and miscarriages. A highly respected epidemiologist, Sister Rosalie Bertell, a brilliant mathematician, calculated a total nuclear industry death toll ... based on nuclear industry statistics ... at well over 1.2 billion people. Double that or triple it if you include animals. The overall death toll from nuclear industry, for all associated activites, is two billion otherwise unaccounted-for deaths. Real, accurate and up-to-date exposure rates in U.S. cities by reactors, here. –Satomi Horikiri, Host (8:30 in): Have you heard of any health hazards in Fukushima? –Setsuko Kida, evacuee from Tomiokamachi: My daughter [got] pregnant in the fall of 2013, but she was diagnosed with tethered miscarriage… the womb grew… but her unborn baby didn’t grow at all. She… got a second opinion from another clinic in Mito, only to get the same result. When the Mito doctor asked her why she came for the second opinion, she told she couldn’t trust the doctor in Fukushima… Many with a birth defect were born after Hiroshima/Nagasaki A-bomb, but the number dropped in one or two years. I only knew the reason in 2013; many women had to have an abortion, so that inconvenient babies wouldn’t be born… One month later, I was happy to know my daughter got pregnant. But in only 3 months my daughter told me the bad news and my mind got flooded with that story of Hiroshima/Nagasaki. That’s where I started to doubt. Although I asked the doctor to wait and see since my daughter could give birth if she tried, but the doctor said that the unborn child inside her was not alive anymore… So she had the abortion. My daughter called and told her friend about her abortion… She was told that out of 4 in her friends group, 3, including herself, had abortion during early pregnancy. The only one who could give birth was told by her doctor that she was unable to give birth because of the baby’s weak heart sound. So my daughter began to doubt her doctor, thinking her unborn baby could have made it. I became doubtful as well. A nurse I knew told me that many get abortions in Fukushima. My daughter and friends are just a few of those. –Host: That is a painful story. –Kida: A year later I got to hear first hand cases of babies with a structural birth defect or polymelia ["Birth defect… in which the affected individual has more than the usual number of limbs" -Source] twice as many. I feel our gov’t or the medical university knows the cause is the radiation… My daughter remembers the words by her doctor… “We’ll send this cell to Fukushima Medical”… Why do they have to send a cell of aborted fetus? Is that what they had been doing? For what? Kida (23:15 in): I just shared the story about my daughter’s abortion and high number of stillbirths. Whenever I deliver such a message I’m told to shut up. 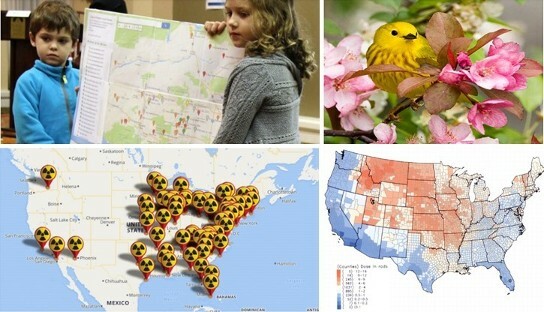 People say it’s a delicate issue, bad influence on Fukushima reconstruction or no data to back up. But more than 10 girls had similar experience as my daughter’s. Actually one woman was recommended to get an abortion at 6 months pregnancy last summer, and her unborn baby lacking one arm, one leg, with only 3 fingers on its foot… The nuclear reactors exploded, melted through… contaminated water keeps flowing into the Pacific Ocean. That’s the reason they asked not to restart nuclear plants. But isn’t the real reason the health hazard caused by radiation coming out? Health hazards are actually caused, and we have to send out such messages. But if we denied health problems… that would be the same as what Tepco or the gov’t is doing. 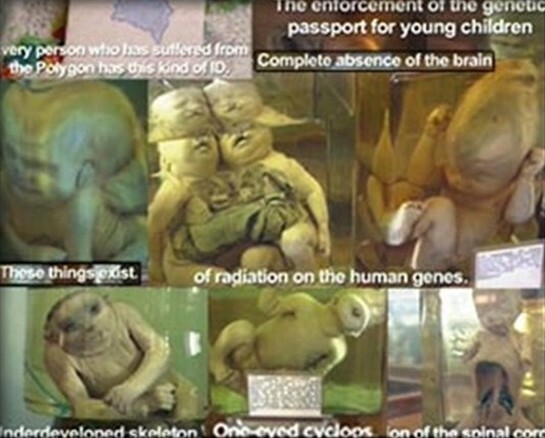 These kids were in their mother's wombs when Chernobyl melted down and blew up, permanently contaminating Ukraine, Belarus, Europe and Eastern Europe...and shredding their reproductive DNA so that as embryos radiouclides prevented them from reproducing faithfully after their own kind ...and their bodies were mutated by nuclear industry (owned by the banking families that own the Fed) (video, here & here) for which you are paying the nuclear industry bill with the blood of your children. 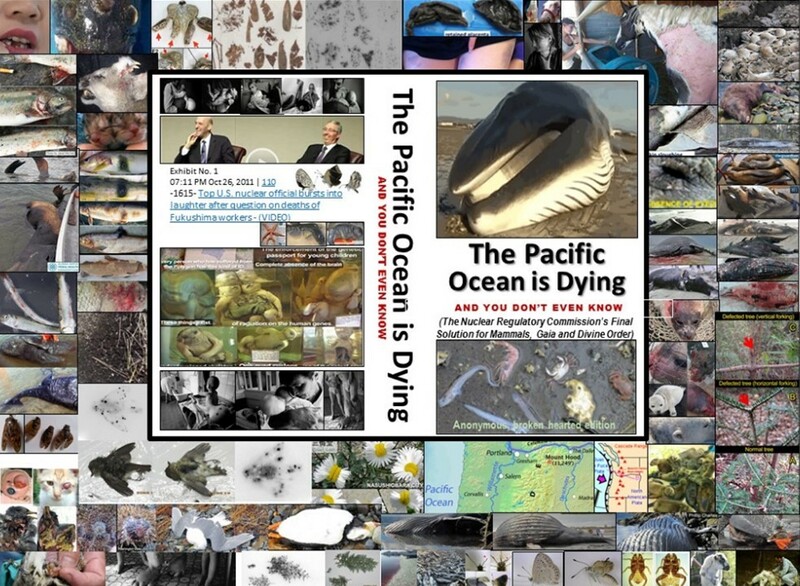 The Pacific Ocean is Dying and You Don't Even Know, was written to tell you what you are not supposed to know about the grave state of the Pacific Ocean: the Pacific Ocean is dying from manmade interference. At first, we thought the millions, and even billions of mutations, diseases, cancers and deaths deaths of sealife in the Pacific Ocean were only from nuclear fallout and nuclear waste from Fukushima, Japan and the four nuclear reactors in Fukushima that blew up into the atmosphere and contaminated the sky around the world then contaminated the air, land, sea, ice and water below whenever it rained through the radioactive clouds circling the globe, and still does ...and the molten cores from those reactors in lava form that melted down into the fresh water acquifers below the reactor sites and beginning in March 2011 and continuing to this very date, and on into the future for perhaps the next 250,000 years releasing several hundred tons of water laced with plutonium, tritium and several hundred other radioactive nuclear isotopes into the Pacific Ocean every day 24x7x365 into the currents that flow from Japan to the United States then circulate around the world, being the migratory currents that whales, dolphins, tuna, salmon and other sealife navigate as they seasonally circumnavigate the Earth's oceans following the feeder fish and feeder foods like plankton, krill, herring and so on. Only problem was, the plutonium and other radioactive ionizing radiation killed entire food chains, and millions of seals, sea lions, dolphins and whales continue to starve to death, some emaciated seals wandering thru the coastside streets of San Francisco and into seaside markets in Southern California begging for food like lost dogs, or hundreds of thousands of sea lion pups dying with not one surviving, for several years while the tide pools from Alaska to Vancouver, British Columbia, Washington, Oregon and California were becoming extinct and people watched millions of starfish disintegrating before them. However, we then realized that in addition to the nuclear waste and fallout from Japan, not only was there 70 years of waste from nuclear testing, nuclear submarines, aircraft carriers, open sea war games and target practice with depleted uranium ...but additionally, directed energy weapons, electromagnetic pulse testing, ionospheric heating experiments all following a pattern mapped out in a U.S. Air Force document called, Owning the Weather by 2025: Weather as a Force Multiplier...in other words, weather warfare that was additionally based on the fact that the biggest solar flare of the year in the sun, when striking the Earth, creates the biggest earthquake on Earth, simultaneously...and the military's ability to simulate solar flares (which also knock out instruments at nuclear reactors as well as first responders radio communications), and to create earthquakes therefrom, as well as from fracking lubricants that oiled the tectonic plates whose movements against each other create earthquakes. And, the hundreds of nuclear reactors around the world, in normal, day-to-day operations daily releasing nuclear fallout into the atmosphere, fresh and sea water, and the accidents and catastrophes not only in the reactors but dumps, uranium mines and transportation from reactor to reactor to dump to dump around the world in an underground brokerage and trafficking at taxpayer expense revealed the deep politics nuclear mafia ... otherwise known as the Federal Reserve Bank and City of London Corporation and their interlocking directorate of member investment banks that own shares of the Fed and City of London and dictate national and foreign policy and military action to the governments of the west served up by the G8/20 and its cohort of billionaires. And, military sonar, like other sonar used in undersea oil exploration, ruptured the eardrums of whales and dolphins and other sea mammals as well as rupturing their body organs, all-in-all creating disorientation and excruciatingly painful deaths for the whales and dolphins we so love ...and accounting for mass strandings of whales and dolphins around the world. That's how J.P. Morgan Chase's head quant, Marko Kolanovic, envisions the next financial crisis. The forces that have transformed markets in the last decade, namely the rise of computerized trading and passive investing, are setting up conditions for potentially violent moves once the current bull market ends, according to a report from Kolanovic sent to the bank's clients on Tuesday. His note is part of a 168-page mega-report, written for the 10th anniversary of the 2008 financial crisis, with perspectives from 48 of the bank's analysts and economists. Kolanovic, a 43-year-old analyst with a Ph.D. in theoretical physics, has risen in prominence for explaining, and occasionally predicting, how the new, algorithm-dominated stock market will behave. The current bull rally, the longest in modern history by some measures, has been characterized by extended periods of calm punctuated with spasms of selling known as flash crashes. Recent examples include a nearly 1,600 point intraday drop in February and a 1,100 point decline in August 2015. "They are very rapid, sharp declines in asset values with sharp increases in market volatility," Kolanovic, the bank's global head of macro quantitative and derivatives research, said in a recent interview. But those flash crashes occurred during a backdrop of a U.S. economic expansion; the new market hasn't been tested in the throes of a recession, he said. "If you have these liquidity-driven sharp sell-offs that come at the end of the cycle, or maybe even causes the end of the cycle, then I think you can have a much more significant asset price correction and even more significant increase in market volatility," Kolanovic said. In his report, Kolanovic explains how the major market trends that occurred after the 2008 crisis exacerbate selling during moments of panic. The massive shift from active to passive managed investments — he estimates that $2 trillion has moved that way in the past decade — has removed a pool of buyers who can swoop in if valuations tumble, he wrote. The rise of automated trading strategies is also a factor because many quant hedge funds are programmed to automatically sell into weakness, he said. Together, index and quant funds now make up as much as two-thirds of assets under management globally, and 90 percent of daily trading comes from those or similar strategies, he wrote. "Basically, right now, you have large groups of investors who are purely mechanical," Kolanovic said. "They sell on certain signals and not necessarily on fundamental developments, such as increases in the VIX, or a change in the bond-equity correlation, or simple price action. Meaning if the market goes down 2%, then they need to sell." Lastly, electronic trading desks at banks and other firms tend to withdraw when markets get rough, removing liquidity and contributing to a cascading decline in prices. If markets fall by 40 percent or more, the Federal Reserve would need to leap into action to prevent a spiral that led into depression, Kolanovic said. That could lead to unconventional actions, including direct purchases of equities, a move that Japan's central bank has already taken. "Suddenly, every pension fund in the U.S. is severely underfunded, retail investors panic and sell, while individuals stop spending," Kolanovic said. "If you have this type of severe crisis, how do you break the vicious cycle, the negative feedback loop? Maybe you stimulate the economy by cutting taxes further, perhaps even into negative territory. I think most likely is direct central bank intervention in asset prices, maybe bonds, maybe credit, and perhaps equities if that's the eye of the storm." In an hourlong interview, Kolanovic said this scenario is less a prediction than a warning about a rising risk. He also said that the chance of a crisis happening are low until at least the second half of 2019. The exact timing of this crisis is uncertain but will be determined by the speed in which the Fed hikes interest rates and reverses bond purchases (a legacy of the last crisis), he said. The developing trade dispute with China could accelerate or delay the end of the cycle as well, he said. An Aug. 28, 1968 file photo shows a demonstrator with his hands on his head is led by Chicago Police down Michigan Ave. during a confrontation with police and National Guardsmen who battled demonstrators near the Conrad Hilton Hotel, headquarters for the Democratic National Convention. He was a bit more measured in his interview. If central banks can head off the worst of a crisis by providing a floor for asset prices, then the status quo will probably be maintained, he said. "If they don't manage to," Kolanovic said, "then you're spiraling into depression, social unrest and a lot more disruptive changes that can negatively affect returns for a very long time." JPMorgan Chase issued a report earlier this week to mark the 10th anniversary of the 2008 Wall Street crash and provide its outlook for what’s ahead. JPMorgan suggests that the next financial crash may be so cataclysmic that the Federal Reserve may have to enter the market to buy up stocks – something which the central bank has never done before in the U.S. or, at least, acknowledged doing, because stock ownership is heavily skewed to the one percent.